معلمی, عارف حسین, کتابداری, محمد جواد. (1396). مدل‌سازی تحلیلی فرش مصنوعی دریایی انعطاف‌پذیر جاذب انرژی امواج دریا در شرایط خلیج‌فارس. نشریه علمی - پژوهشی هیدروفیزیک, 2(2), 41-50. عارف حسین معلمی; محمد جواد کتابداری. "مدل‌سازی تحلیلی فرش مصنوعی دریایی انعطاف‌پذیر جاذب انرژی امواج دریا در شرایط خلیج‌فارس". نشریه علمی - پژوهشی هیدروفیزیک, 2, 2, 1396, 41-50. معلمی, عارف حسین, کتابداری, محمد جواد. (1396). 'مدل‌سازی تحلیلی فرش مصنوعی دریایی انعطاف‌پذیر جاذب انرژی امواج دریا در شرایط خلیج‌فارس', نشریه علمی - پژوهشی هیدروفیزیک, 2(2), pp. 41-50. معلمی, عارف حسین, کتابداری, محمد جواد. مدل‌سازی تحلیلی فرش مصنوعی دریایی انعطاف‌پذیر جاذب انرژی امواج دریا در شرایط خلیج‌فارس. 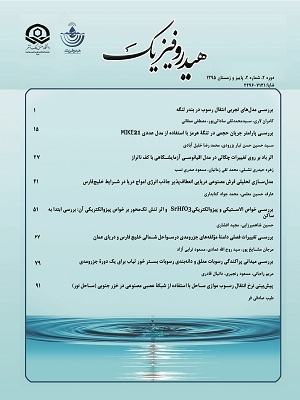 نشریه علمی - پژوهشی هیدروفیزیک, 1396; 2(2): 41-50. تاکنون روش‌های مختلفی برای استخراج انرژی امواج، ابداع شده که اکثر این روش‌ها بازده مناسبی در آب‌های کم‌عمق و موج‌های کم‌ارتفاع ندارند. گل ولای بستر دریا قابلیت جذب بخش درخورتوجهی از انرژی موج عبوری را در طول موج‌های مختلف دارد. با الهام‌گیری از این ویژگی طبیعی می‌توان ایدۀ یک مبدل جدید انرژی امواج را با قابلیت کار با راندمان بالا در آب‌های کم‌عمق مطرح کرد. اگر در نزدیکی سواحل، کف دریا به وسیلۀ مبدلی پوشانده شود، می‌توان بخش شایان توجهی از انرژی موج عبوری را جذب کرد. این مبدل با توجه به جزء اصلی سازنده‌اش که صفحه‌ای ویسکو الاستیک و انعطاف‌پذیر و فرش‌مانند است، فرش مبدل انرژی امواج (CWEC) نامیده می‌شود. در این مقاله با استفاده از مدل‌سازی تحلیلی، قابلیت این فرش درجذب انرژی امواج در شرایط مختلف دریایی بررسی شده و به مقایسۀ این مبدل با دیگر مبدل‌های انرژی پرداخته شده است. نتایج نشان داد که به دلیل بازدهی فراوان این فرش در آب‌های کم‌عمق با دامنۀ موج کم و مکانیزم عملکردی کاملاً مغروق آن و ایجادنکردن هرگونه خطر برای حیات زیر آب، می‌توان آن را به‌عنوان یکی از گزینه‌های مناسب برای استفاده در خلیج فارس مطرح کرد. سپس ایدۀ جدید استفاده از المان‌های پیزوالکتریک در دستگاه CWEC جهت افزایش بازدهی آن، طرح و بررسی شد. نتایج نشان داد که ترکیب پیزوالکتریک به CWEC می‌تواند بازده این دستگاه مبدل انرژی را به‌طورقابل ملاحظه‌ای افزایش دهد. So far, various methods for extracting wave energy have been developed. However, most of these methods have low efficiency in shallow waters and for the small wave amplitude. The mud of the seabed is able to absorb a significant portion of wave energy in different wave lengths. In this paper inspired by this natural characteristic, the idea of a new wave energy converter with the ability to work with high efficiency in shallow water is proposed. If close to the coast, the sea floor is covered by the converter, a significant proportion of wave energy can be absorbed. The main component of this carpet of wave energy converter (CWEC) is a flexible and visco-elastic plate. In this paper, first, by using an analytical modeling, wave energy absorption capability in different sea states of Persian Gulf was considered and compared with other wave energy converters. Further investigations revealed that because of the high efficiency of this converter in shallow waters, it can be suitable for application in the Persian Gulf. Then, the new idea of using piezoelectric elements in the CWEC device was designed to increase its efficiency. The results show that the piezoelectric combined with CWEC could significantly increase the efficiency of this energy converter device. Gade HG. Effects of a non-rigid, impermeable bottom on plane surface waves in shallow water. Journal of Marine Research. 1958;16:61–82. Alam MR. Nonlinear analysis of an actuated seafloor-mounted carpet for a high-performance wave energy extraction. Proceedings of The Royal Society A. 2012 Oct 8;468(2146):3153-71. Alam MR. A flexible seafloor carpet for high-performance wave energy extraction. Proceedings of 31st International Conference on Ocean, Offshore and Arctic Engineering; 2012 Jul 1; Rio de Janeiro, Brazil. American Society of Mechanical Engineers; 2012. p.839-46. Lehmann M, Elandt R, Shakeri M, Alam MR. The Wave Carpet: Development of a Submerged Pressure Differential Wave Energy Converter. Paper presented at: 30th Symposium on Naval Hydrodynamics; 2014 Nov 2-7; Hobart, Tasmania, Australia. Faiz J, Ebrahimi-salari M. Wave Power Resource in Iran for Electrical Power Generation. Proceedings of World Renewable Energy Congress-Sweden; 2011 May 8-13; Linköping, Sweden. Linköping: Linköping University Electronic Press; 2011. p.3412-19 (No.057). Mac pherson H, and Kurup PG. Wave damping at the Kerala mud banks, southwest India. Indian journal of Marine Sciences. 1981;10:154–60. Renzi E, Dias F. Hydrodynamics of the oscillating wave surge converter in the open ocean. European Journal of Mechanics-B/Fluids. 2013 Oct 31;41:1-10. Gao X, Shih WH, Shih WY. Flow energy harvesting using piezoelectric cantilevers with cylindrical extension. IEEE Transactions on Industrial Electronics. 2013; 60(3):1116-8.